This publication is the first of its kind. 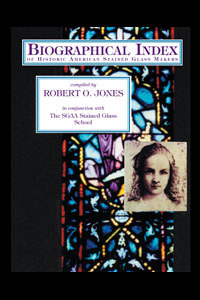 It broadly defines the history of stained glass in the United States in terms of the people and studios that practiced the trade. The entries date from the colonial period until 50 years ago. To be included, the person or studio must have been actively involved in the United States or Canada 50 or more years ago. Excellent for academic research and for those engaged in restoration. Back to list of publications.